And a victory. It is always nice to beat Surrey, even in 12 player practice games. We were in a pretty precarious position at one stage but James Foster rebuilt the innings for us and Grant Flower, showing his talent for flogging spinners through mid-off, saw us home. Report here (you have to click on the fixture in the calendar - i could not get it to link directly). Last edited by Marauding Bison : 6th April 2007 at 15:01. Yes, in front of the pavilion from about 5.20pm until the end. I note you gave the shindig a miss. How did we miss you?! We were sitting near the main entrance, in the set of seats just to the right of the pavilion. You can't have missed us... Oh well, next time then. Regarding the shindig, not only were we very sunburnt...there was so much traffic, we didn't reach Gants Hill until 8pm! Then we just couldn't be bothered...plus, we're shy! 21 ball 50 for Foster today, and a hundred for Cook. 334 off 50 overs. Essex have beaten Surrey (again!) by six runs. It looks like it was another fantastic game. As NB says Essex reached 334-5, with Foster and Cook playing well, but so did Chopra with 60*. Surrey were bowled out for 328 (49ov), with RtD taking four wickets and also Middlebrook. Tony Palladino took the other two. Perhaps Cook was intimidated by your fanatical support on Thursday? The traffic was terrible. I left chelmsford at about 6.35 and but reached south woodford (i.e. further than Gants Hill) by 7.40. Did you get lost? Saw a bit of Essex -v- Middlesex over lunch today. Watched Foster and Grant Flower get out cheaply to crap shots and Middlebrook repeatedly launch the bowling into the river. Game all over by the time I finished work. Oh for goodness sake...missed you again! Are you trying to avoid us?! p.s. No, we didn't get lost last time...my friend decided to stay on the lane for the M25, until she/we finally realised what was happening! Essex were in action against Middlesex yesterday, and they've suffered their first loss of the pre-season friendlies. Middlesex made 324-4 off 50 overs...with Billy Godleman contributing 107, Ed Smith 84 and Owais Shah 80. Essex then could only make it to 289-9 from their 50 overs, it's a surprise they even got that far...as Ronnie Irani, G Flower, Graham Napier, and Darren Thomas all fell for ducks. Mark Pettini scored 51, RtD 76...the young lad Tom Westley 55 and Jahid Ahmed finished 35*. Middlesex won by 35 runs. Essex are playing again today against Worcs...they made 255-7 off 50 overs. Roger Sillence with 89*, and Kabir Ali...46*...he then took the wicket of Irani...! Four ducks!!! Was it ECCC I joined or the RSPB? How can you miss me? There are not that many fat and dilapidated blokes wearing suits who turn up on their own, probably between 1pm and 1.15 then leave at about 2, then might drop in again later at about 5.30. And there is a picture of me on the Redbridge website. Well, dropped in at lunchtime today (since Worcestershire were visiting had a pie for lunch in honour of Kabir Ali and Gareth Batty) and for the last hour. Met Kiki, which was nice. Was it ECCC I joined or the RSPB? I've just found out that the student membership is 55 quid! Do we get the same rights as you other folks, if yes...that's a bargain! Plus, you know what I look like, you could've approached me! Essex news...they were beaten by Worcs on both Thursday and Friday. probably a grey suit, white shirt and red and blue tie. 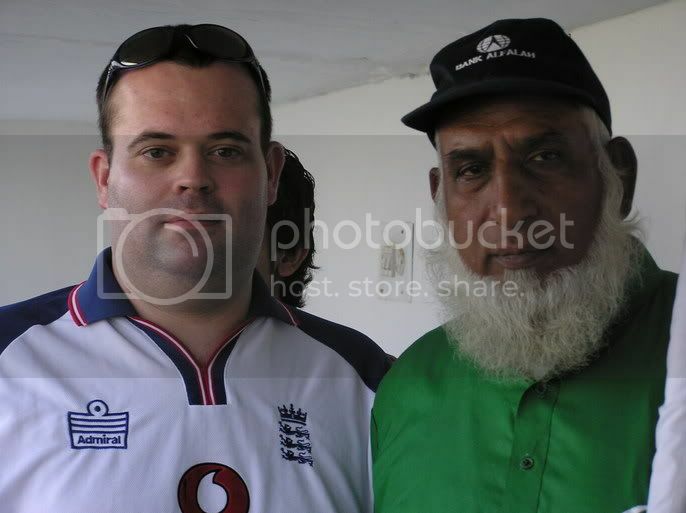 Oh I give up, this is a picture of me with Pakistan's very own Chacha Cricket. BTW Cookie was it you stood in the gateway under the bridge with a couple of friends when i walked past on my way out of the ground? It did occur to me that might have been you however i did not ask as i could not remember what your real name is. Last edited by Marauding Bison : 14th April 2007 at 14:51.
my hair may be greying and receding but I have not reached teh white beard stage yet, thank you very much. My friend is an art student and wanted a photo of the graffitti under there! You were in a rush to get home it looked like...strolled right past! I had gone down there to see the closing overs after work but sadly by the time i got there i had missed them so was heading back to pick up my car. i was not in a hurry, i just tend to walk quite quickly. Could I ask where you park your car? We usually park in the car park next to the ground, which costs us £3.30 for the day...but, on Tuesday we had to use the multi-storey one...which cost nearly £8.